In the latest issue of Revista de Biolog? ?a Tropical, an important paper was published about the malaco-biodiversity of two areas in northern Argentina. Both areas are in Prov. Tucum? ?n and cover two contrasting biotopes: the humid Yungas and the xerophytic Chaque??a. 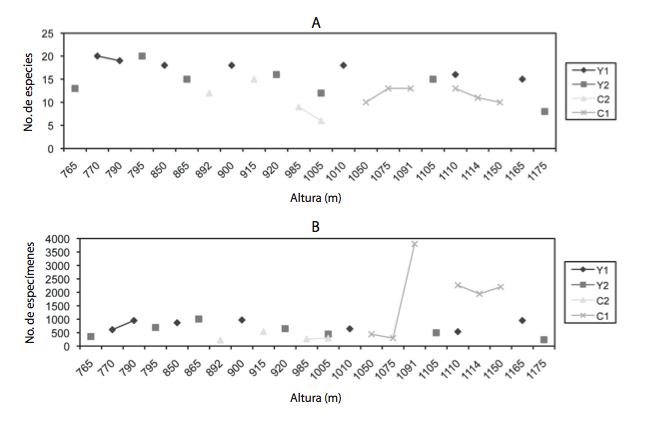 In each biotope, two transects (Y1, Y2, C1, C2) were sampled in which 25 plots of 10×10 m were sampled for snails, both micro- and macromolluscs. The diversity of these areas are compared to other studies that have been done in Argentina, Brazil, and French Guyane. Studies related to land mollusk diversity in tropical and subtropical forests are scarce. To assess this, a study on land snail diversity of subtropical cloudforest (Yungas) and dry forest (Chaco) areas of Sierra de San Javier Park, Tucum? ?n, Argentina, was carried out. Taxonomic identifications were performed to species level and built a species per stations data matrix to analyze diversity patterns on qualitative and quantitative samples processed from 10x10m quadrates in altitudinal transects. Non parametric analysis (ICE, ACE, Chao 1 and Chao 2) were used to estimate the true diversity of the area, as well as the degree of undersampling and spatial aggregation of the data. Diversity was also calculated using Shannon, Simpson, Whittaker and Jaccard indices. The richness of the San Javier Park was estimated to be 32 species distributed into 13 families and 21 genera. From the total number of species collected, a single one belongs to Caenogastropoda, while the rest of the species are classified into Pulmonata Stylommatophora and Systellommatophora. The most representative family was the micromol- lusc Charopidae, while the most relatively abundant species was another micromollusc snail, Adelopoma tucma. Richness and diversity were slightly more elevated in dry forest areas of the Chacoan Ecoregion than in cloud forest areas of Yungas. Non parametric estimators showed that the inventory was complete. Diversity values obtained were high in comparison to previously studied areas of Northwestern Argentina. The total number of specimen collected (22 169 specimens), was higher than other published studies. Miranda, M.J. & Cuezzo, M.G., 2010. Biodiversidad de gaster? ?podos terrestres (Mollusca) en el Parque Biol? ?gico Sierra de San Javier, Tucum? ?n, Argentina. – Revista Biologia Tropical 58: 1009-1029. This entry was posted in Uncategorized and tagged argentina, diversity, ecology, literature on October 21, 2010 by bramb.